Assured playing by the Jyväskylä Sinfonia, with soloists such as the cellist Arto Noras and pianist Ralf Gothóni, and a fine commemoration of Sallinen's 80th birthday. One of the internationally most well-known Finnish composers, Aulis Sallinen (b. 1935) celebrates his 80th birthday in 2015. As a tribute, Ondine is releasing the complete Chamber Music (I-VIII) series by the composer. The 2 CD set includes virtuosic chamber works performed by, among others, the award-winning Meta4 String Quartet, Jyväskylä Sinfonia, cellist Arto Noras and conductors Ville Matvejeff and Ralf Gothóni, who are also both appearing here as soloists. 1975 and 2009 are fascinating character pieces full of passion, and often written after the completion of larger opera projects. They contain dance-like elements, elements of humour and memorable melodies. They are also revealing Sallinen's stylistic development in the last four decades. 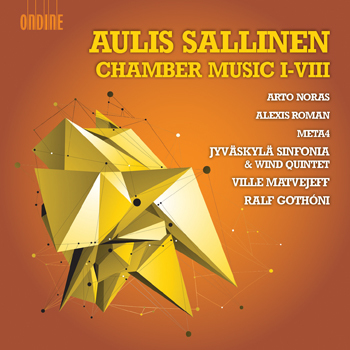 Chamber Music III (The Nocturnal Dances of Don Juanquixote) is among the most popular works by Sallinen and often described as a ‘cello concerto' by various commentators. Chamber Music VI and VII receive their world premiere recordings, as well as Ralf Gothóni's adaption of the Chamber Music V for piano and strings (originally for accordion and string orchestra). Ralf Gothóni has created a worldwide career as a pianist and a conductor. He served as the Chief Conductor of the English Chamber Orchestra during 2000-2009, and has recorded some 100 titles for various international record labels. This new release is the Ondine debut for the young and versatile Ville Matvejeff who enjoys a rapid success as conductor, composer and pianist throughout Europe as well as the USA, China, Japan and Mexico. Matvejeff assumed the position of Chief Conductor of the Jyväskylä Sinfonia in January 2014. The orchestra, founded in 1955, is known for its versatile repertoire, which includes works from the classica and romantic eras as well as contemporary music.